I Am Not a Serial Killer is a YA supernatural horror novel. It is the debut novel of Dan Wells. You may or may not know who Dan Wells is. I only know of him because I listen to the Writing Excuses podcast, of which he is a part. Well, I just finished reading his debut novel, I Am Not a Serial Killer. You should be able to tell, just from the title, this is not the normal thriller fare. In fact, it’s a supernatural horror, young adult novel. I came into reading this book with no real preconceived notions. I have heard Dan Wells speak on some of the challenges of writing it on the podcast, but I still did not know exactly what to expect. After reading it, I will go on to read (and review) the next two in the series if that means anything to anybody. 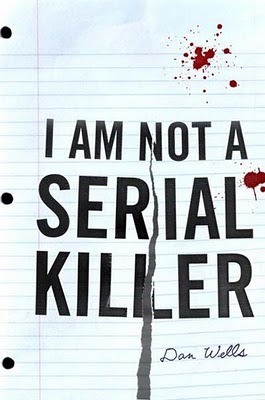 I Am Not a Serial Killer is about a fifteen-year-old boy, John Wayne Cleaver, obsessed with serial killers. He even suspects that he may potentially be one himself. This is confounded by the fact that his therapist diagnoses him as a sociopath. All those misunderstood, angst ridden, teenage feelings come to a head when a serial killer actually does show up in his small town, and starts murdering people. This sets John on a mission to profile and find this killer, all the while fighting back the monster within himself that is eager to come out and play too. As I said, it’s a fun novel. I was a bit concerned that I did not find that I cared too much for the main character, John. But as this is a first novel, I am sure there is a lot of growth over the course of the next two installments, Mr. Monster and I Don’t Want to Kill You. I did enjoy the drama that plays out between him and his mother, as she tries to deal with her eccentric child. On the other hand, I found that I cared for the main antagonist much more than the main character himself. Another thing about this novel that needs saying, without spoiling anything, is that it is a supernatural horror. Keep in mind the “supernatural” part. Since I knew it going in, I wasn’t surprised by it. But, I have read this threw a few people for a loop while reading what they thought was just a young adult thriller. Also, do not let the “young adult” label scare you away. Teenagers and adults alike can read and enjoy this book. There is a lot to like about it. The narrative is tight and moves along at a rapid pace. It may even give you something to think about with its many looks at exactly what it means to be human. I recommend it as a quick and entertaining read.